Where's your favourite haunt for lunch time food? Well, for me and my lunch colleagues, we have this few lunch spots we patronize daily on a regular basis. Today, I'm going to do a short write up on this particular lunch spot in Taman Melawati. Tiam Fatt Restaurant is located in Taman Melawati which is around roughly 15mins drive away from my company. It's a rather cozy little place, with air conditioning and your regular tables and seats. The food here ranges from curry chicken rice, to Hokkien mee, Wat Tan Hor, Ngau Yok Hor and ala carte vegetable, meat and seafood dishes. Just outside the restaurant, they sell chao zhou yee mee and the pan mee. The other 2 stalls outside the restaurant sells the best yam cake and char kuay teow in town. Anyway, the dish I ordered yesterday lunch break was this Char Kuey Teow. The owner was from Penang, so the dish he serves up is as close to the real thing in Penang, except for afew differences here and there. 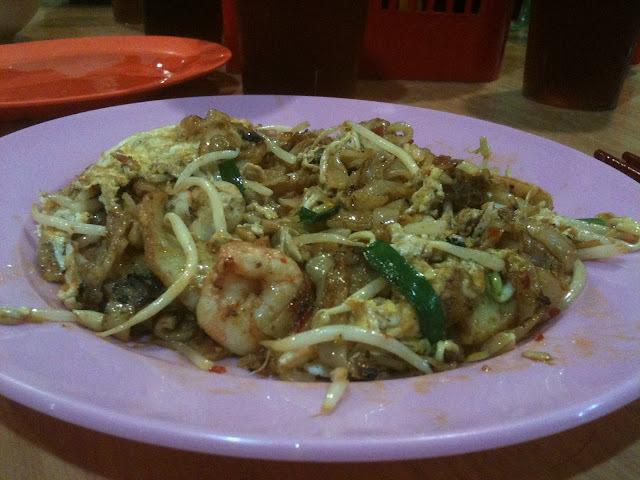 For example the kuey teow is slightly wetter than Penang fried kuey teow. It tastes great though! I would recommend anybody dining there to try this sinful dish. But be warned it is rather oily. For those who are into Foursquare, you can check into Tiam Fatt Restaurant when you're here as well.